Prices are set to fall even more as 2011 wears on, according to new research, which is great news for consumers, but bad news for manufacturers. Indeed, the situation has gotten so bad that performance manufacturer OCZ has decided to exit the RAM market completely, and reported significantly lower revenue from RAM in the third quarter of 2010--from $22 million in 2009 to just $6 million in 2010. If you're running Windows 7 or Vista with less than 2GB of RAM, then more RAM will certainly make things quicker, but if you already have 4GB then the rewards are likely to be smaller. However, upgrading could be seen as future proofing against upcoming operating system releases--there hasn't yet been a release of Windows that's required less RAM than its predecessor. 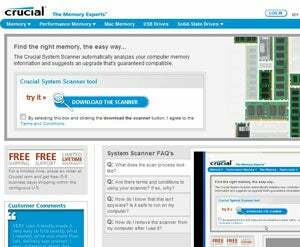 Crucial System Scanner show what memory your PC takes. Start by downloading the System Scanner from Crucial. This will tell you exactly what memory your computer takes, along with how many memory slots you have. Don't worry, you haven't got to follow up by buying anything from Crucial. Unfortunately, laptop RAM upgrades nearly always involve replacing the entire existing memory, because most laptops only feature two slots that are usually already occupied. This happens because it's always cheaper for laptop manufacturers to fit RAM in pairs, rather than as a single expensive module. However, desktop users might have a few RAM slots free and might be able to simply add in more alongside. Upgrading desktop computers is usually easy, and will involve little more than cracking open the case and firmly inserting the DIMM modules into the slots on the motherboard. Laptop manufacturers usually make RAM upgrades easy, and you might have to remove a compartment cover on the bottom of the case using a technical screwdriver, or perhaps slide aside clips in order to lift the keyboard out of the way. Whatever the case, check the manual for details, or contact the manufacturer direct. One tip for notebook users is to ensure the computer is shut down before performing the upgrade, and not in sleep or hibernation mode. It's a good idea to unplug the power supply and temporarily disconnect the battery too, if that's possible. Be careful where you buy your RAM. This is one situation where it's a good idea to avoid eBay. Ensure you buy branded modules, made by reputable manufacturers, such as Samsung, Hynix, Kingston or Crucial. If the retailer simply doesn't reveal who manufactured the module (or the chips it contains) then move on. Once you receive the RAM, an application like SIW will allow you to view the manufacturer details, so you can ensure you haven't been ripped off with cheap, generic memory that's likely to fail sooner rather than later.